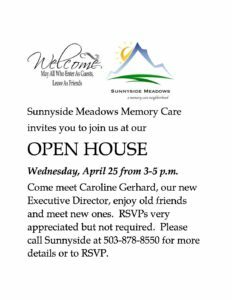 Sunnyside Meadows Open House — Come Meet Our New ED! Please join in welcoming Caroline Gerhard, our new Executive Director. Enjoy the opportunity to catch up on professional connections and make new ones while welcoming Caroline to Sunnyside. RSVPs not required, but appreciated. Please call 503-878-8550.